Roundtrip training buses, not in service to the public, will depart every 20 minutes from the ARTIC station in Anaheim to the Downtown Disney District and the Anaheim Garden Walk. Participants can take unlimited rides during this event for free. WHO: Service and therapy animals, along with their handlers, will be at the event. In the past, this training has attracted about 200 trainers and 150 service animals each time. 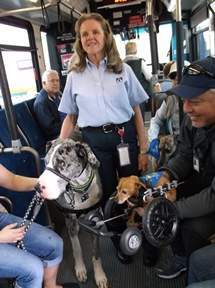 WHY: This training event, which OCTA has coordinated for more than 20 years, will allow service dogs to familiarize themselves with large crowds, loud noises and unfamiliar sights and sounds while boarding, riding and exiting an OCTA bus. Participants are also encouraged to ride a Metrolink train as part of their training. Standard fares apply. After the event, interested trainers can apply for the OCTA Bus Mobility Trainer card that allows trainers and their dogs to ride OCTA’s fixed-route system free of charge while in training. The photo ID costs $4.